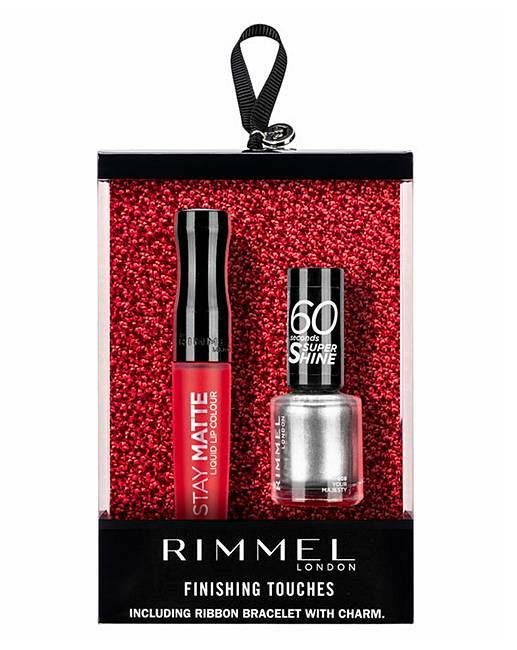 Rimmel London Finishing Touches gift set. The Stay Matte liquid lipstick gives you bold colour with just one stroke. It has impressive staying power – kiss-proof, touch-proof and water-proof wear. With a velvety matte finish. The 60 Second nail polish is formulated with 3 in 1 technology for up to 10 days wear. With high impact colour for an ultra-shiny finish. Just one stroke for precise application. FREE Lips Make Up Pouch with this Rimmel item. Black make up pouch with tassel on the zip and red glitter lips design. This cute little bag is perfect for your beauty essentials! H.12.5 x W.19.5 x D1.3cm. Free gift available while stocks last. The free gift will be sent directly with your Rimmel order. Gift set contains: Stay Matte liquid lip colour - shade: Firestarter, 60 Seconds Super Shine nail polish - shade: Your Majesty. Includes a ribbon bracelet with charm.